Nike recently began offering a service whereby customers can have a word or phrase custom-stitched onto their shoes. 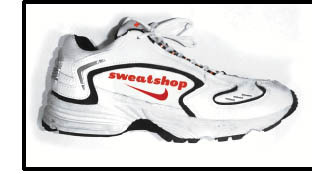 In January, Jonah Peretti, an MIT student and anti-sweatshop campaigner, filled out the form and sent Nike $50 to stitch "sweatshop" onto his shoes. The following is his ensuing correspondence with the company. 1) Your Personal iD contains another party's trademark or other intellectual property. 2) Your Personal iD contains the name of an athlete or team we do not have the legal right to use. outlined in your message. 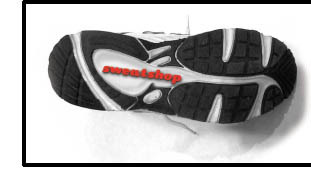 The Personal iD on my custom ZOOM XC USA running shoes was the word "sweatshop." 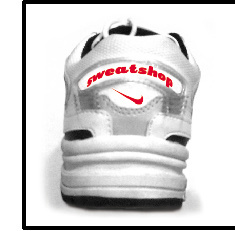 Sweatshop is not: 1) another's party's trademark, 2) the name of an athlete, 3) blank, or 4) profanity. I chose the iD because I wanted to remember the toil and labor of the children that made my shoes. Could you please ship them to me immediately. Although I commend you for your prompt customer service, I disagree with the claim that my personal id was inappropriate slang. After consulting Webster's Dictionary, I discovered that "sweatshop" is in fact part of standard English, and not slang. The word means: "a shop or factory in which workers are employed for long hours at low wages and under unhealthy conditions" and its origin dates from 1892. So my personal iD does meet the criteria detailed in your first email. Your web site advertises that the NIKE iD program is "about freedom to choose and freedom to express who you are." I share Nike's love of freedom and personal statement. The site also says that "If you want it done right ... build it yourself." I was thrilled to be able to build my own shoes, and my personal iD was offered as a small token of appreciation for the sweatshop workers poised to help me realize my vision. I hope that you will value my freedom of statement and reconsider your decision to reject my order. "Nike reserves the right to cancel any Personal iD up to 24 hours after it has been submitted". "While we honor most personal iDs, we cannot honor every one. Some may be (or contain) others trademarks, or the names of certain professional sports teams, athletes or celebrities that Nike does not have the right to use. Others may contain material that we consider inappropriate or simply do not want to place on our products. Unfortunately, at times this obliges us to decline personal iDs that may otherwise seem unobjectionable. In any event, we will let you know if we decline your personal iD, and we will offer you the chance to submit another." With these rules in mind we cannot accept your order as submitted. Thank you for the time and energy you have spent on my request. 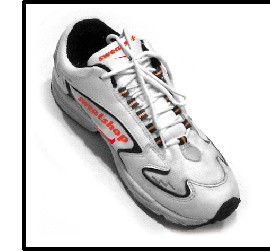 I have decided to order the shoes with a different iD, but I would like to make one small request. Could you please send me a color snapshot of the ten-year-old Vietnamese girl who makes my shoes?